We are delighted to share our new brand film with you! The film follows on from new look packs and an updated website filled with delicious recipes. The film tells the story of a South Asian family living in modern Britain. The children of the family are the stars of the show; they have all been encouraged and inspired to follow their dreams, becoming who they want to be. We see a teenage boy go off to university; his dad has taught him what university won’t, how to make a perfect chapatti. His friends love his food! His older sister has been also inspired by her Mum’s cooking. She now works as a head chef in a busy restaurant. She keeps connected to her routes, designing a beautiful and delicious roti cup, she is always looking for a new and exciting twist. Both of them have been given the grounding and confidence from their parents to go out and follow their dreams through sharing traditional values and culture. 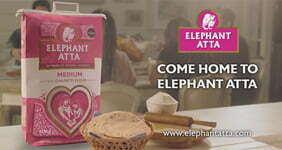 At the heart of the family is Elephant Atta, connecting them with their roots and representing home, a thought, which is captured by our tagline “Come home to Elephant Atta”. You can watch the film across our social media platforms as well on major South Asian TV Channels. We’d love to hear your thoughts on our film and how your family have inspired you to become who you want to be!